Avaya stole the show at EC18, with a new, smarter toll-free service for the contact center. Earlier this month at Enterprise Connect 2018, the seminal gathering for the enterprise communications industry, I had the opportunity to exchange ideas with some great people in the enterprise mobility space as part of the mobility-related sessions I helped organize (a responsibility I take very seriously). As is usually the case, mobility was a sideshow at EC, and we had any number of vendors pushing mobile solutions based on models that we know from countless predecessors are essentially guaranteed to fail -- don't these guys read No Jitter? However, out of the mobile morass emerged one captivating new service idea. Surprisingly, it came from Avaya, not a traditional service provider, and it took the form of a new toll-free voice service for the contact center (far and away the biggest market for toll-free services), and it was geared toward the needs of mobile callers. What this announcement says is that Avaya has become a carrier, a "mobile operator" to be specific, through what it calls the Avaya Cellular Business Network (CBN). For most of us, the idea of being a "carrier" conjures up images of dozens to hundreds of points of presence (POPs), thousands of miles of fiber optic cable, sales offices across the country, trucks, pole climbers -- in short, "the works." If you make that a "mobile operator" you can add in cell towers, radios, radio licenses, backhaul facilities, mobile switching centers, home location registers -- again, "the works." Avaya will be doing very little of that. According to Tracy Fleming from Avaya's Office of the CTO, the company will be building multiple data centers to offer the service in commercial hosting facilities so they will be able to offer geo-redundant access. It is also building an IMS core network for delivering toll-free and DID voice services to enterprise users. Avaya will have no extensive facilities-based landline network like a traditional wireline carrier, and no radio access network, radio licenses or wireless subscribers like a traditional mobile operator. However, for today'virtualized, cloud-based world, it will have what is needed to deliver toll-free voice service. Avaya also has one other critical element that is key to its product differentiation: As a registered mobile operator, the company has access to the cellular signaling network. That access is provided through a partnership with an unnamed mobile operator, who is identified in a blog by David Chavez, also from Avaya's office of the CTO, as a "willing and energetic mobile partner." In modern telephone networks, signaling networks are separate overlay data networks that interconnect the switching points, allowing them to coordinate the process of setting up and tearing down calls and providing calling features like vanity toll-free numbers. AT&T designed the first common channel signaling network in the 1970s with its proprietary Common Channel Inter-Office Signaling (CCIS). The basis for standards-based network signaling for landline networks was Signaling System 7 (SS7) that was developed as part of the move to ISDN (remember that acronym?). 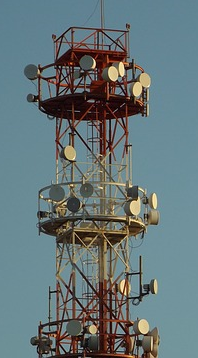 The initial cellular networks used a version of SS7, however, a cellular network had to accommodate a much wider range of user behaviors than a fixed line network. For example, cellular signaling networks had to accommodate users who were roaming outside of their home network. Those users would have to be authenticated (so the carriers would know they'd get paid for handling their calls) and the over-the-air encryption would have to be initiated. Also, things like the cell tower they were accessing could be captured. One very important thing cellular signaling networks would record was whether a call originated on a wired or a mobile line. If the call originated on their network or was passed to them from another mobile operator (who would also be connected to the cellular signaling network), it was known to be "mobile." However, if the call was passed to them from a landline operator, it was "wired." That distinction is important for a number of reasons, not the least of which is the mobile operator needs to know if they can send the station SMS messages. So, what this all adds up to is that Avaya is a provider of wired toll-free services, but one (for now, the "only one") who has access to the internal network information only available on the cellular signaling network. That combination is going to allow them to sell toll-free services with features and capabilities the like of which we haven't seen before. So What's Avaya Selling? "Sim Ring for the Contact Center"
Avaya clearly has a multi-phase plan for its network stretching over several years, though the initial service called the Avaya Mobile Experience should be rolling out to general availability in the May-June timeframe. Essentially this will be a toll-free voice service targeted at contact centers, a natural market extension for Avaya's contact center business. The key differentiator is that Avaya's service will offer a crafty intercept and alternate service option for mobile callers. I've often joked (not necessarily to the delight of the UC vendors) that the only successful mobile application they've ever come up with is simultaneous ring, or Sim Ring. The irony is that Sim Ring essentially routes the call out of the stodgy old phone system they're selling and onto the type of flexible functional tool users really want -- their smartphones. Avaya is now pitching the same idea for mobile callers to contact centers. Of course, as a contact center operator, you want those callers on the website if possible. It's already way cheaper to serve them there than with live voice agents, and that difference will only increase with expanding use of AI-enabled chatbots. This also makes the job of delivering a useful and effective (as well as engaging) Web experience the highest priority. To get into the game, the contact center would have to transfer its toll-free services and port its toll-free numbers to the Avaya CBN; Avaya will only support SIP trunks and not your old fashioned PRIs. This would also involve reterminating its services (or more likely, ordering replacement services) to one or more of the Avaya CBN POPs. The key feature of the Avaya toll-free service comes from its access to the cellular signaling network, which will allow it to differentiate mobile from landline callers and offer special handling for the mobile ones. With Avaya Mobile Experience, when calls arrive at the Avaya CBN, landline calls are delivered to the contact center as usual, though in the future they may be accompanied by a richer set of signaling information gleaned from the cellular signaling network. Mobile calls are identified and intercepted in the network and the caller is given a voice prompt asking if he or she wants "an enhanced mobile experience." The caller can then press something, like "1", and the network can send a personalized SMS message to the user's mobile device with a link to the customer service area of the company's website. The voice call is then disconnected (stopping the toll-free billing charges), and the caller can click the link and be taken to the company's website. Like Sim Ring, the Mobile Experience service gives mobile callers the option to avoid the contact center experience. Avaya's press materials also note that the service can be used to access any vendor's contact center platform, though Avaya users clearly have an advantage through the tight coupling between the network service and the Avaya platforms with access to features like Breeze Snap-Ins. That's a question the landline carriers should be asking themselves already, and if they have any sense, they should be looking at what it will take to mimic it. In this blog, David Chavez, a VP in Avaya's CTO office, claims that some elements of its capabilities are patent pending. We will be watching to see if and how quickly other carriers could roll out copycat offerings or if this will degrade into some type of patent kerfuffle. Amazingly, AT&T, Verizon, and Sprint all have both wireline and cellular operations, but it appears their traditional practice of operating the wireless and wireline services independently has come back to haunt them. Kudos to Avaya for recognizing the opportunity, putting the pieces together, and catching the carrier businesses flat-footed. The question now becomes, how good is Avaya going to be as a service provider? I work with the carriers a lot, and it is still pretty difficult to operate a long-distance network and deliver the top-notch services to demanding enterprise customers. Those services would include not just delivering voice calls, but sales, sales engineering, installation planning, SIP signaling support, number porting, customer service, billing, problem resolution, etc. According to Fleming, Avaya will be selling and supporting the Mobile Experience service through its contact center sales channel, though it will likely be beefing up the workforce to manage the service provider business. A failure on that front will likely kill this baby in the crib. Based on what we've seen thus far, it appears that Avaya has plans that go far beyond the initial Mobile Experience offering, though Fleming cautions not to expect those within the calendar year. A lot of that future functionality will be tied to other data from the cellular signaling network Avaya could provide to contact centers like user location that is more reliable than the caller's area code -- something that's fairly irrelevant in the mobile world. Even further down the line, there are hints Avaya is looking at deeper integration into mobile apps. That type of capability would involve challenges that are orders of magnitude more perplexing than delivering a network-based call intercept that occurs before the call even reaches the contact center. I intend to explore those possible longer-term extensions in a future blog post, but Avaya's horizontal expansion into the service provider space and opening access to a wider range of network signaling intelligence is by itself a big development. Avaya's next challenge will be execution on the operations front, and selling contact center customers on the value of the first significant development we've seen in the service provider space in some time.